I have signed the March 14, 2017 statement authored by Professors Cornel West and Robert George, issued by the James Madison Program in American Ideals and Institutions at Princeton University. In light of the growing frequency with which speakers on university campuses are shouted down or dis-invited because they hold views that are at variance with the majority or controversial, this is an exceedingly timely and inspiring statement I was proud to sign and that gives voice to values of tolerance and free speech that I hold dear. A link to the statement is below. I encourage you to read this beautifully and clearly stated case for intellectual tolerance and curiosity, and to thoughtfully examine the ideals and principles articulated therein. Peter Crane’s ‘biography’ of the Ginkgo, and the responses to it from around the country and world, are a reminder of how much there is to learn from and appreciate about a single species of tree. And the Ginkgo is well-known in comparison to tens of thousands of other tree species. Telling the story of a species — writing such biographies — puts a face on biodiversity and makes us pause and realize just how special and amazing each species is. We can’t see the forest for the trees unless we study ecosystems as wholes. But it is equally true that we can’t see the trees for the forest unless we tell the fascinating stories of each kind of tree, too. KD Dijkstra’s thought-provoking essay in Nature (citation below) is well-worth a read. He argues that we — and most alarmingly, most professional biologists — have lost ‘species sense,’ focusing instead on functional aspects of life and the biosphere. He describes biodiversity as the embodiment of sustainability, implying that our stated commitment to a sustainable future is inconsistent with our exploration and knowledge of its best prospects. Because taxonomy and natural history as terms have been maligned as being old-fashioned and anachronistic, KD suggests in their place resurrecting Haeckel’s term bionomy. If a new term would accelerate return of support for natural history I would be on board, but there is something deeper at work here. Astronomy, for example, is a similarly old term and discipline seen as modern and respected. That something deeper has more to do with the loss of what KD describes as species sense. It is time that we come to our species senses before it is too late. I thoroughly enjoyed Ms. Rolnick’s essay on “The Story Tree” in the just-released edition of the ESF literary journal Unearthed. We do want to tell our stories. We want, as she said, “something more permanent to pass on to our descendants,” those who follow. Unearthed is one way to do so without scarring an unsuspecting American beech. We are searching for other ways to tell our stories, too, such as the recent ESF participation in the Planet Forward summit in Washington, DC, videos cast to the outer reaches of Youtube, the Travis lectures, and scientific papers that nudge the direction of the fields we engage. 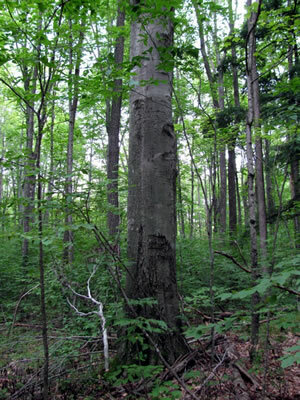 It is useful, too, I think, to view ESF itself as one particularly long-lived beech tree. Each student, staff, faculty, and friend who joins our community leaves their mark on the College that is, like the story tree, a living thing. Every entering class brings energy that renews the institution as a whole yet is shaped by the accumulation of indelible marks left by those who came before. Studies of climate change in the Eocene are instructive regarding the kinds of changes driven by atmospheric CO2 levels. Those who take comfort in the fact that the climate has always changed — and it has — are clinging to false hope. One of the lessons of most climate shifts in the past — even big ones: picture palm trees on the eastern Antarctic coastline and alligators in the Canadian Arctic — is that they were slow and gradual giving animal and plant life time to migrate or to adapt. The obscenity of the current anthropogenic CO2 spike is that it is happening on a brief historical time scale as opposed to a protracted geologic time scale meaning that the flora and fauna have time to neither change latitudes nor adapt in place. In a late January edition of The Conversation, NOAA scientist Christopher Clack shares results from the National Energy with Weather System (NEWS) simulator that suggest how high-voltage direct current lines, integrated into a transmission network rather than simply point to point delivery systems, could vastly improve the cost competitiveness of renewable energy sources such as wind and solar, even in the absence of the breakthrough in battery technology everyone is anxious to see. Acceptance of alternative energy sources by the public is closely tied to cost and the increased efficiency of direct current transmission opens exciting possibilities for increasing their price competitiveness. A combination of such data-driven production and consumption patterns, parallel technological advances including both transmission and storage, and a bridging strategy from the status quo to something approaching meeting energy needs with zero emissions paints a very hopeful picture of the future.